pandas | Is life worth living? I would like to convert smiles string which has Cl or Br atoms convert to new one which has L as Cl and R as Br. I wrote simple code for my note. OK. If I use vectrize function the performance will be increased. I posted an example about cytoscape.js using molecular similarity. 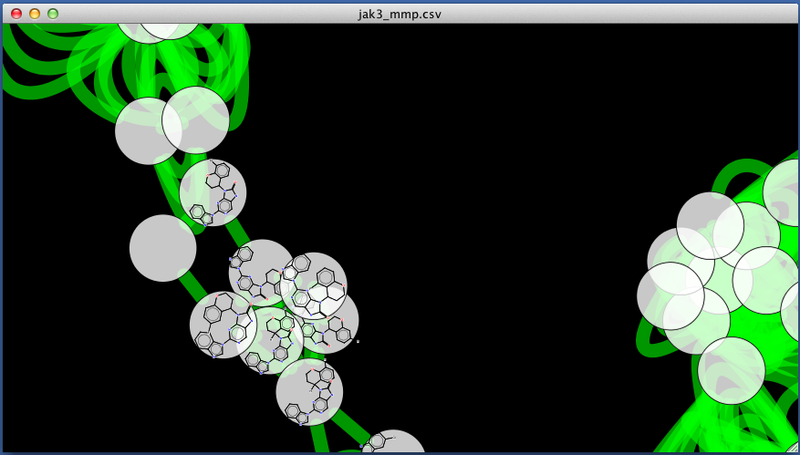 Cytoscape.js is cool but not good for lots of data. I tried to make network that has 1000 nodes. My PC freeze…. So I go back to cytoscape. Today I made network from mmpa data for example. If you had rdkit, make mmp is very easy. First, I got sample data from Chembl (Jak3 inh.) as tsv. For rdkit, file format must be, smiles id. I used PANDAS for do it. Then make fragment file from smiles. MMPA scripts are $RDBASE/Contrib/mmp . 829   51884  448065 bioactivity-14_7-19-38.txt # 829 mols in this file. 42031   42031 6558703 frag.smi # 42031 frags made! 8466    8466 1729873 jak3_mmp.csv # Just done! I got pair files jak3_mmp.csv. This file has some field, SMILES_OF_LEFT_MMP,SMILES_OF_RIGHT_MMP,ID_OF_LEFT_MMP,ID_OF_RIGHT_MMP,SMIRKS_OF_TRANSFORMATION,SMILES_OF_CONTEXT. I got mmp-csv file. Cytoscape can read this file. So , from cytoscape, new network from file and SMILES_OF_LEFT_MMP as source, SMILES_OF_RIGHT_MMP as target. I used ChemViz to convert smiles to structure. It’s easy to add node attribute(ex, activity, target, mol prop. etc…) and make your custom view using vizmapper. I upload sample file to github. https://github.com/iwatobipen/mmp_example. Be careful, this example code is incomplete, because this code ignore molecule that has no pair (singletone).